TV’s hottest stars stepped out in cool white platinum at the 68th Primetime Emmy Awards in Los Angeles on Sunday. Viola Davis, an Emmy nominee in the category of Outstanding Lead Actress in a Drama Series, looked stunning in a vibrant pink gown by Marchesa. Her jewelry by Harry Winston included cluster diamond chandelier earrings (16.39 carats), Secret Combination diamond bracelet (68.75 carats) and Traffic diamond ring (1.43 carats). The talented actress was nominated for her work on ABC’s How to Get Away with Murder. Project Runway‘s Heidi Klum, who was nominated in the category of Best Host for a Reality or Reality-Competition Program, delighted her fans in a sultry, cut-out gown by Michael Kors and platinum jewelry by Lorraine Schwartz. Dangling from Klum’s ears were pear-shaped diamonds boasting a total weight of 32 carats. She also wore two diamond rings, with a total weight of 10 carats and 2 carats, respectively. Making a big splash on the red carpet was Kristen Bell, who will star in NBC’s The Good Place this fall. The actress wore a champagne bouffant gown by Zuhair Murad and accessorized it with breathtaking platinum jewelry by Harry Winston. Among her accessories were chandelier diamond earrings (9.2 carats), marquise cluster diamond bracelet (44.35 carats), round brilliant diamond ring (3.69 carats) and a diamond band (1.04 carats). 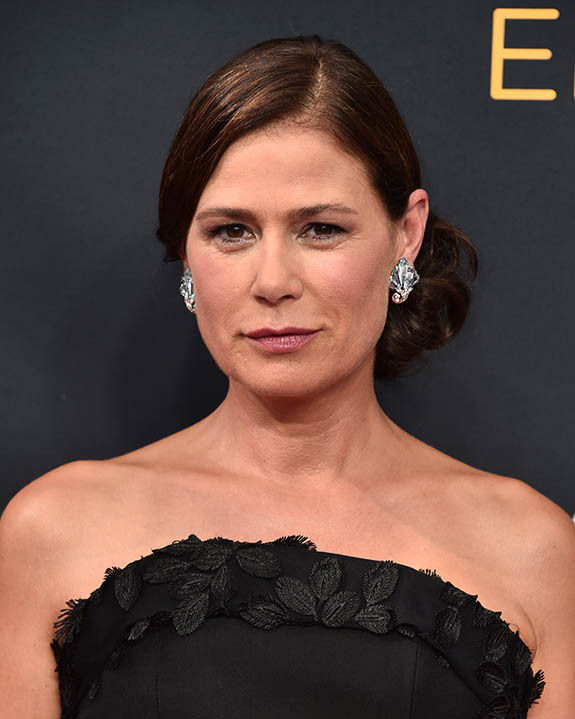 The Hollywood stars connected with their red carpet jewelry with the help of Platinum Guild International (PGI USA) and StyleLab as part of its Emmy Suite. Style expert Michael O’Connor was on hand to match celebrities with curated platinum pieces from renowned brands.